While many of the Players were busy with ‘The 39 Steps’, a small group were busy rehearsing an original one-act play, ‘Nothing you can Say’, written by our own Peter Yates. The play was performed at the Spelthorne and Runnymede Drama Festival in Sunbury on Thames last week, and it received very positive comments from adjudicator Jan Palmer Sayer. We’re delighted to report that Peter Yates subsequently won the award for “Best Original Play”, and Lewis Pickles won the “Adjudicator’s Award” for his direction of the play. Congratulations both!!! Congratulations also to Ruby Joy, who was nominated as “Most Promising Youth Player”, Kevin Bowers, nominated as “Best Supporting Player”, Naomi Scott, nominated as “Best Actress” and Andrew Craddock, nominated as “Best Actor”. 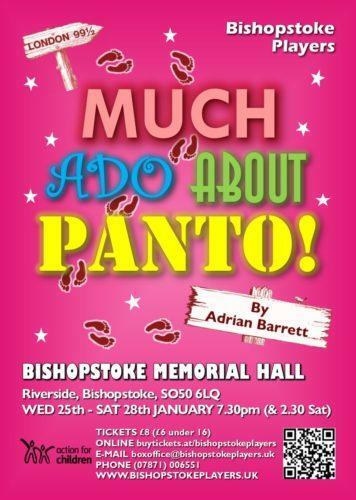 Join young Billy Shakespeare as his journey from Stratford upon Avon to the Globe Theatre becomes a pantomime! Watch as his own mother turns against him and he is left with only his beloved Annie and a couple of retired highwaymen (one of whom seems to have a cheese fixation!) as his only companions. Will the final curtain come down on Billy before opening night? Will the press-gang, or even the Queen herself come to his rescue? 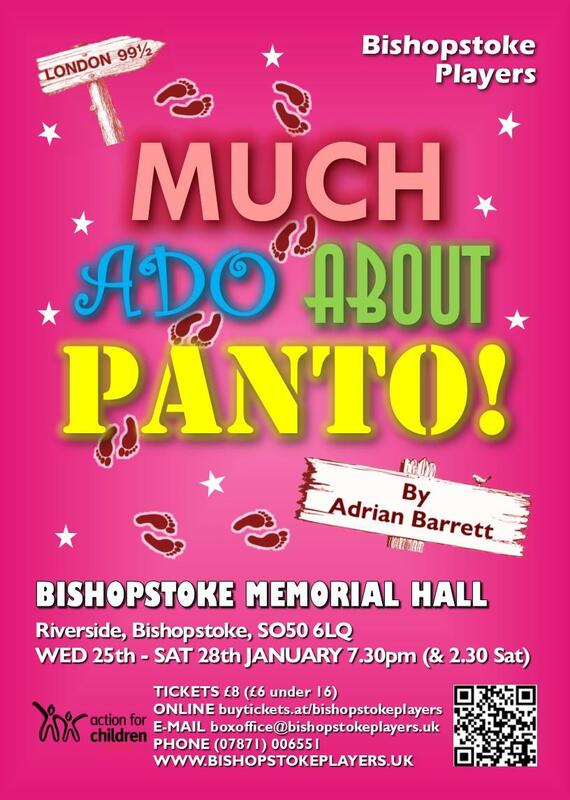 Find out when Bishopstoke Players perform ‘Much Ado About Panto!’ – so good it could have been written by the Bard himself! Oh no, it couldn’t!! !